Editor’s note: This is the fourth and final part in a series examining the arms and equipment employed by the Iraqi Special Operations Forces, in light of the prominent role played by this unit in recent fighting. Part 1 (personal equipment) is available here, Part 2 (precision rifles) is available here, and Part 3 (machine guns) is available here. Whilst employed less frequently than the other types of small arms and light weapons covered in this series, grenade launchers and anti-armour weapons have still played a role in Iraqi special forces operations during the reconquest of parts of Iraq from the Islamic State. 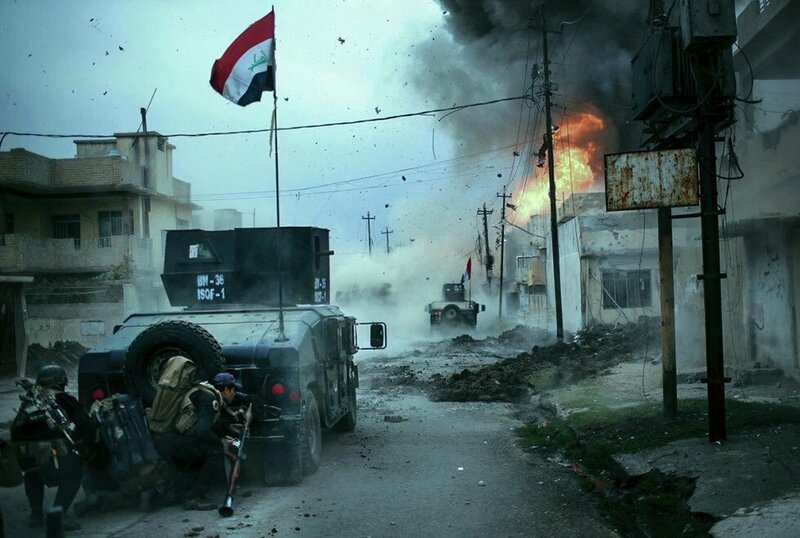 Complementing other types of weapons used in the fighting, weapons firing high explosive munitions were used sparingly due to the significant collateral damage they could inflict on the civilian population of Mosul, as well as the logistical burden of ammunition resupply from a limited Iraqi support infrastructure. One of the key systems in service with ISOF is the 40 × 46SR mm M203 under-barrel grenade launcher (UBGL), typically coupled with an ISOF member’s M4 pattern self-loading rifle. The two primary variants in use are a 9-inch barrel version using an early type of short, ventilated replacement handguard and the more modern and widely-used 12-inch barrel M203 that is mounted underneath the barrel and Picatinny handguards of an M4 rifle. The 9-inch barrel version, in addition to their reduced length, have a distinctive shape. In the past there have been at least 5 makers of this configuration; Colt, Lewis Machine & Tool, Knight’s Armament, Airtronic, and RM Equipment. The examples in Iraq appear to be primarily sourced from surplus U.S. military stocks. Most of these are of Colt manufacture. However, LMT examples have also been documented in use. 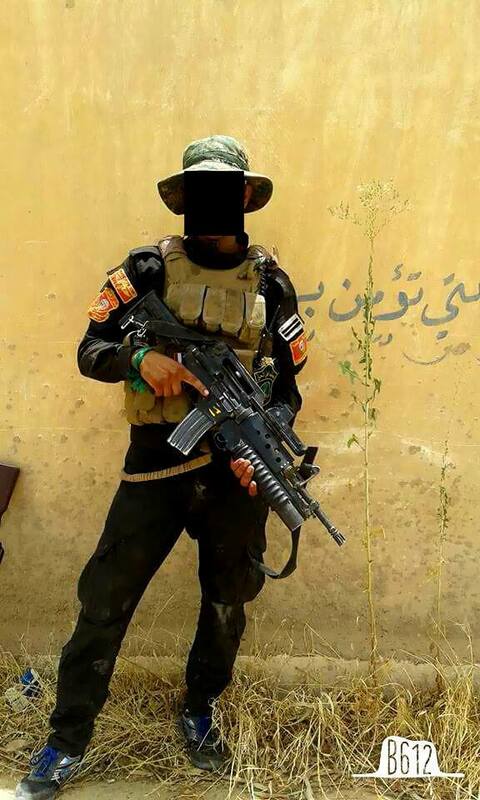 An ISOF operator with a 40 × 46SR mm high explosive dual-purpose (HEDP) round chambered in his M203 UBGL. Of the M203 models in use, very few are mounted with the appropriate flip-up leaf sights that align with the M4 front sight post for aiming purposes. Instead, many of the ISOF grenadiers place AN/PEQ-2 aiming devices at the 12 o’clock position. This does not pose an issue when used with M203 models with 12-inch barrels, but complicates mounting for the variants with 9-inch barrels that use the shorter handguards. To solve this predicament, some ISOF grenadiers have been using M16A2-type carry handle mounts which attach to the standard A2 carrying handle on an M4 pattern rifle and have a Picatinny rail extension that rests over the handguard of the rifle. This allows any Picatinny-mounted optic to be placed in a forward position. 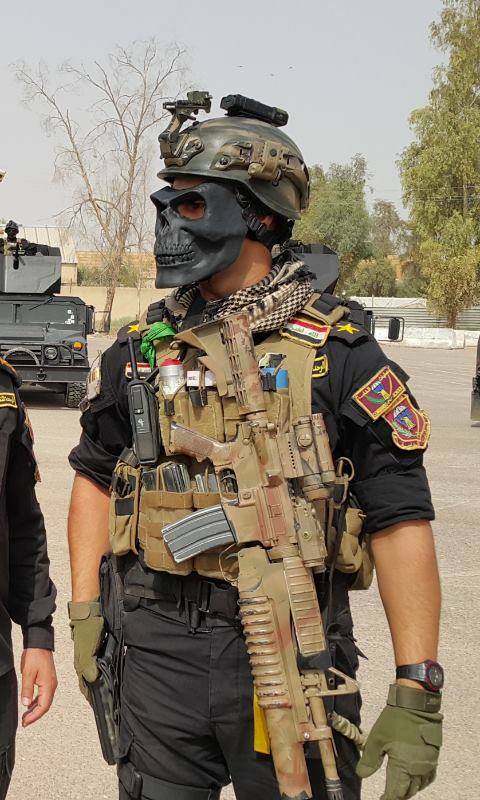 This ISOF operator has the 9-inch barrel M203 with an early short, ventilated handguard mounted to his M4 pattern rifle. Note the A2 carrying handle optics mount with EOTech 512 holographic sight. 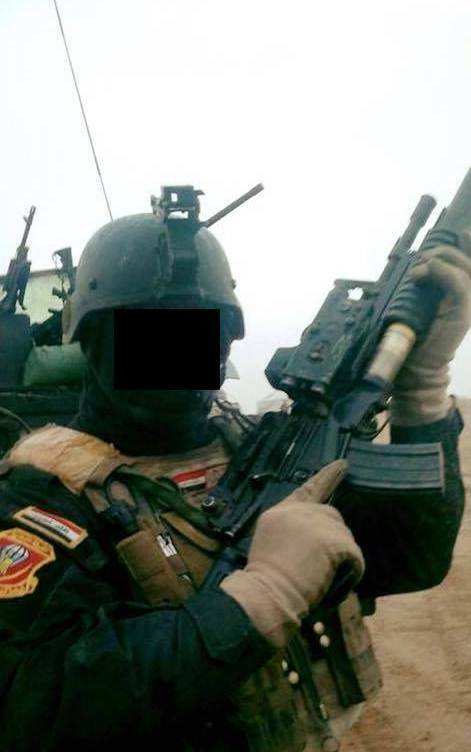 This ISOF fighter has the 9-inch barrel M203 but also has a handguard-mounted flip-up sight. He has taken off the A2 type handguard and replaced it with an EOTech 512. 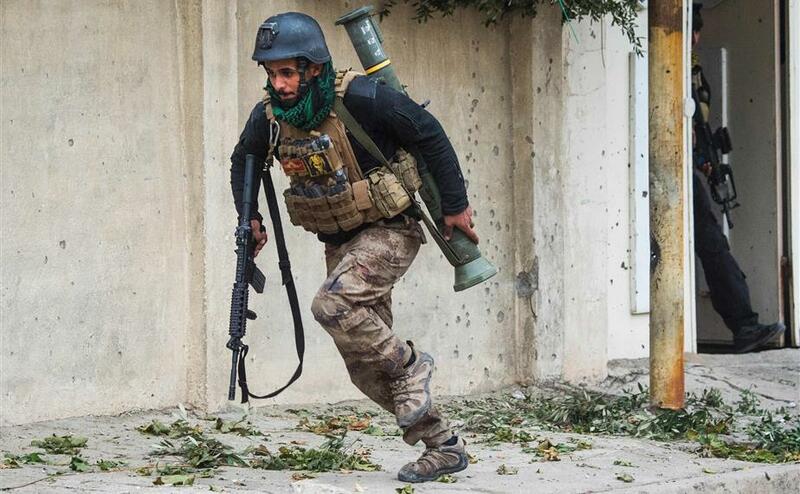 Interestingly, images showing ISOF fighters with M203 pattern grenade launchers rarely show any spare cartridges among the soldier’s gear. In fact, there is very little video or imagery showing ISOF members firing these weapons. ARES spoke with current and former members of ISOF, and it was revealed that supplies of 40 × 46SR mm cartridges are extremely low ISOF-wide. Grenadiers are carrying their M203 UBGLs and even have purpose-designed MOLLE pouches mounted on their plate carriers, but very few combatants have been issued more than one round. In some cases, no ammunition is carried. In order to deliver high explosive direct supporting fires on the battlefield, ISOF troops have instead turned to a variety of man-portable anti-armour systems that can be hand-carried throughout the dense urban streets of Mosul. These range from 84 mm AT4 recoilless weapons to the ubiquitous RPG-7. 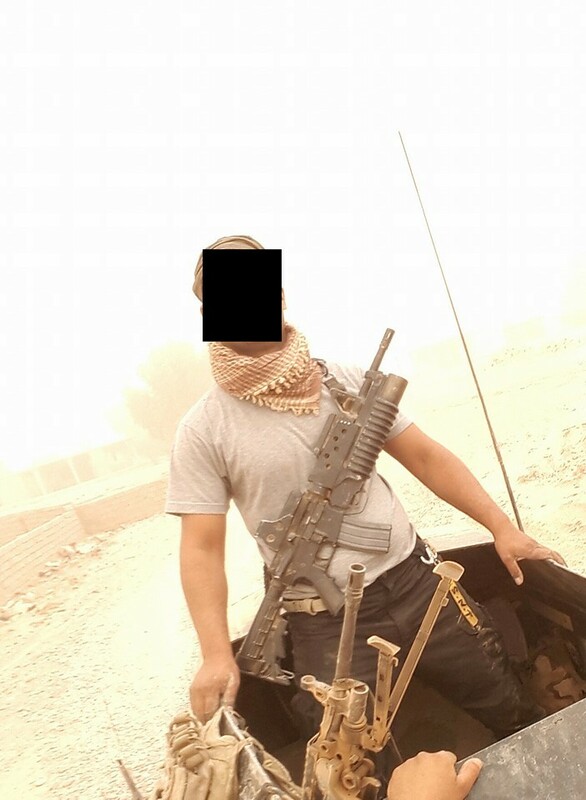 An ISOF fighter with a 40 × 46SR mm red star cluster illumination round in a chest-mounted pouch. Note the rounded M4 handguards rather than the standard 3-sided Picatinny type. These have occasionally been seen in use by ISOF with their M203 UBGL-equipped rifles. 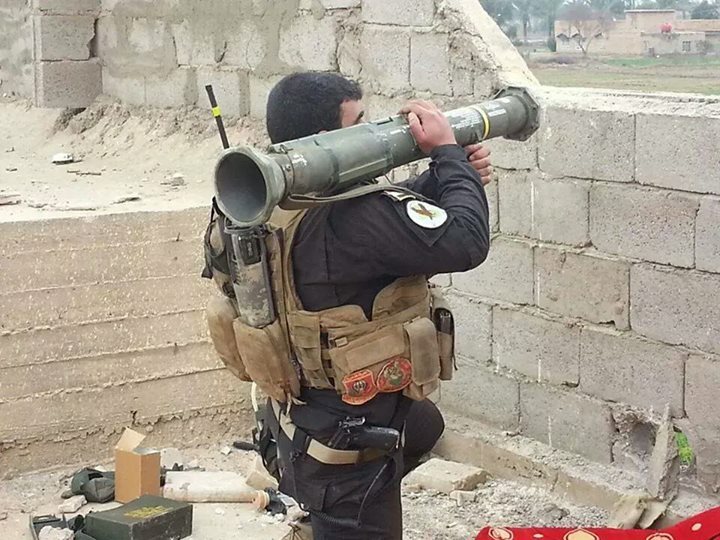 ISOF employ both the US-supplied Saab 84 mm AT4 single-shot recoilless anti-armour weapon and the RPG-7 multipurpose recoilless weapon of Soviet origin. There has also been limited use of 66 mm M72 LAW type rocket launchers. Although the AT4 is single-use and somewhat bulky to carry on foot, the reliance on vehicles as a base of operations and for fire support means that ISOF teams are rarely far from a mobile firebase in combat. AT4 anti-armour weapons seem to be in good supply due to US logistics support of its own forces. An ISOF operator dashes between cover with an AT4 slung across his back. Operating primarily from vehicles allows ISOF personnel to carry less non-combat equipment, making more room for larger items such as the AT4. An ISOF grenadier prepares to fire his AT4 at an insurgent position. The PRC-152 radio mounted on his back indicates that he is probably a team leader. Note also the M9 self-loading pistol. Whilst the RPG-7 is generally less accurate than the AT4, it does allow a single ISOF team to sustain a reasonably high rate of fire whilst remaining foot-mobile. PG-7V and PG-7VL anti-tank projectiles are carried, as are limited numbers of OG-7V anti-personnel projectiles. Many of the projectiles appear to be of Bulgarian origin, but a wide range of manufacturers’ munitions are known to be circulating within Iraq, and ISOF are likely to have employed captured and recovered stockpiles. Either the operator or an assistant is often seen carrying purpose-designed backpack pouches for carrying spare rounds. RPG-7 pattern weapons from a variety of Eastern Bloc countries appear to be in use, and it appears that most originate from Iraqi Interior Ministry purchases, rather than supplies to ISOF via Foreign Military Sales from the United States. 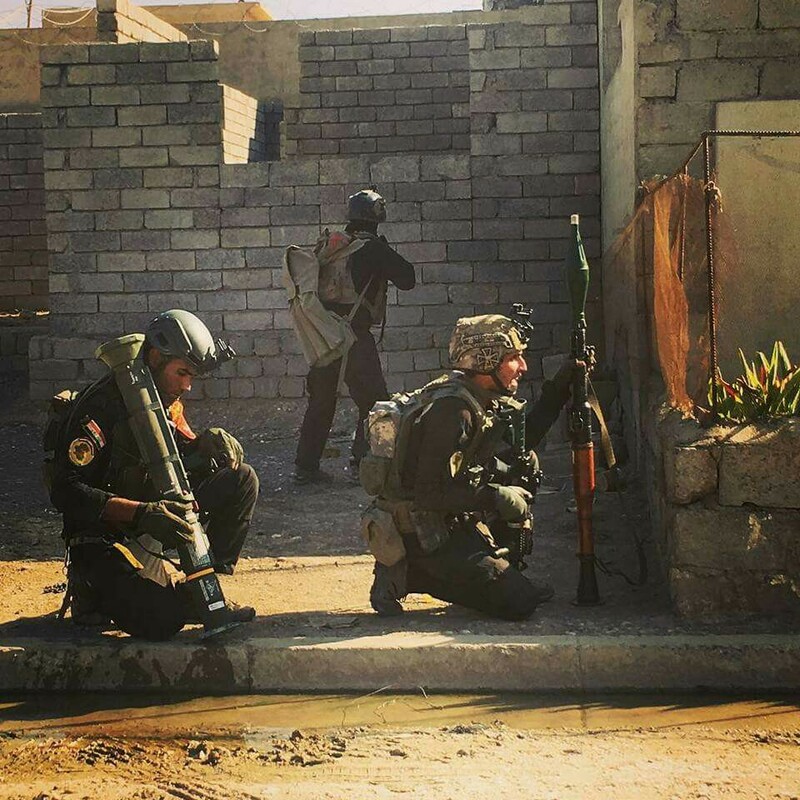 This ISOF team is employing both the AT4 and the RPG-7 anti-armour weapons. Note that the RPG-7 gunner has a PG-7V type projectile loaded, whilst his assistant (carrying spare ammunition) provides rear security for the team. An ISOF convoy under attack. It appears an SVBIED has just detonated nearby. Note the RPG-7 gunner crouched behind the HMWWV with spare ammunition on his back; his assistant is also carrying spare rounds. In addition to man-portable systems, ISOF also makes extensive use of the MK 19 40 × 53SR mm automatic grenade launcher (AGL). Within the ISOF arsenal the MK 19 is almost entirely confined to a vehicle-mounted role, generally fitted to turrets with improvised armour mounted on M123 series HMWWVs. The majority of the HMWWVs in use carry M2 type heavy machine guns (HMG) as a primary source of firepower. A small number are instead armed with MK 19 AGLs, however. Unlike 40 × 46SR mm ammunition, 40 × 53SR mm cartridges for the MK 19 appear to be readily available. Although ISOF has this automatic HE fire support capability, it has been used relatively infrequently in recent operations due to the potential friendly-fire and collateral damage it can inflict in the confined spaces these engagements have been fought in. The MK 19 is also considered by some ISOF members as less effective than the M2 HMG at stopping certain lightly-armoured, relatively fast SVBIEDs used in ambushes in tight urban terrain. The MK 19 AGLs in use with ISOF are largely US-supplied versions made by General Dynamics Ordnance and Tactical Systems, but a small number are believed to Korean Daewoo K4 models. 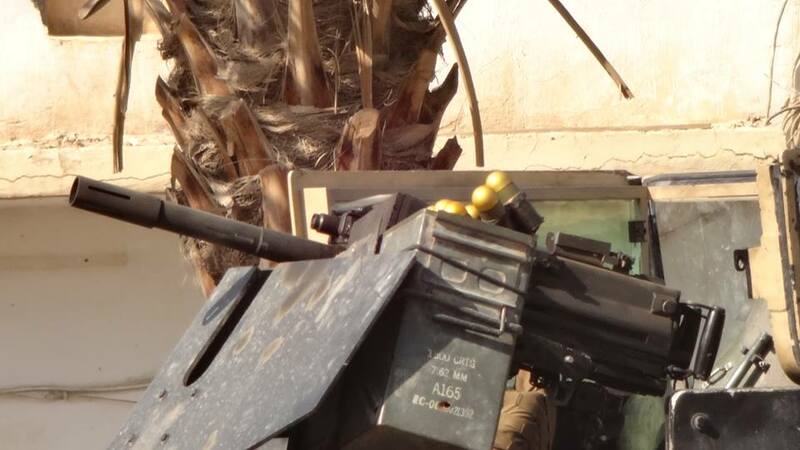 A MK 19 automatic grenade launcher fitted to the turret of an ISOF HMWWV. 40 × 53SR mm ammunition has also been modified for use in improvised air-delivered munitions, dropped on to battlefield targets by commercial off-the-shelf (COTS) small unmanned aerial vehicles (UAVs). In the Iraq-Syria theatre, this concept was first employed by the Islamic State, but such munitions are now employed by Iraqi security forces, including ISOF. 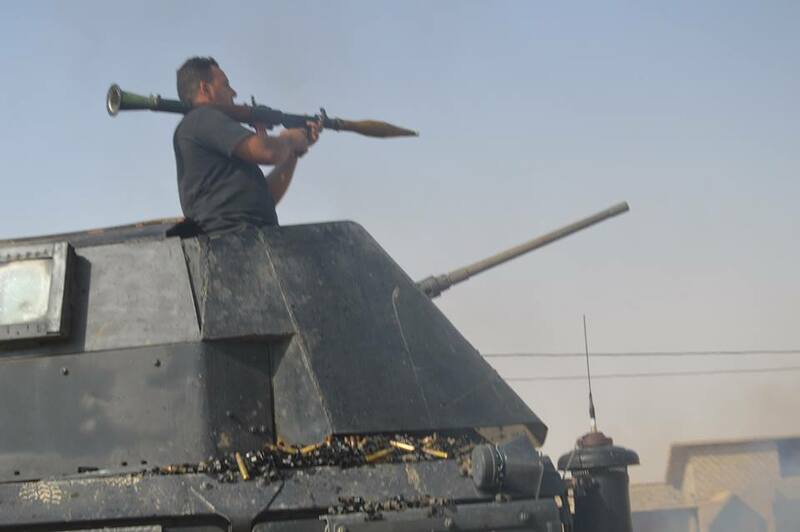 Iraqi government forces often make use of commercially-available shuttlecocks to provide some aerodynamic stabilisation. Note on image sources: ISOF and other Iraqi social media and news aggregator sources via the ARES CONMAT database.